A team led by a Purdue University researcher has achieved images of a virus in detail two times greater than had previously been achieved. Wen Jiang, an assistant professor of biological sciences, led a team that used the emerging technique of single-particle electron cryomicroscopy to capture a three-dimensional image of a virus at a resolution of 4.5 angstroms. Approximately 1 million angstroms would equal the diameter of a human hair. The breakthrough was enabled through the use of Purdue's Condor distributed computing grid, which comprises more than 7,000 computers. Purdue's Condor flock - which links desktop machines, computers in student computing labs, and powerful research computers - is the largest distributed computing network at a university. Computer programs are used to extract the signal from the microscope and to combine thousands of two-dimensional images into an accurate three-dimensional image that maps the structure of the virus. This requires use of a large data set and could not have been done without the resources of Purdue's Office of Information Technology, or ITaP, Jiang said. "ITaP provided us with computational power at the supercomputer scale that was necessary for this work," he said. "Purdue's Condor flock allowed us to take advantage of the power of 7,000 computers. This was a critical element to our success." John Campbell, associate vice president of information technology, says this is one example of the type of discoveries that can be made using distributed computing. "This work was done while the computers weren't otherwise being used," Campbell said. "We are capturing what would have been wasted computer cycles and putting them to use doing groundbreaking science in a cost-efficient way." 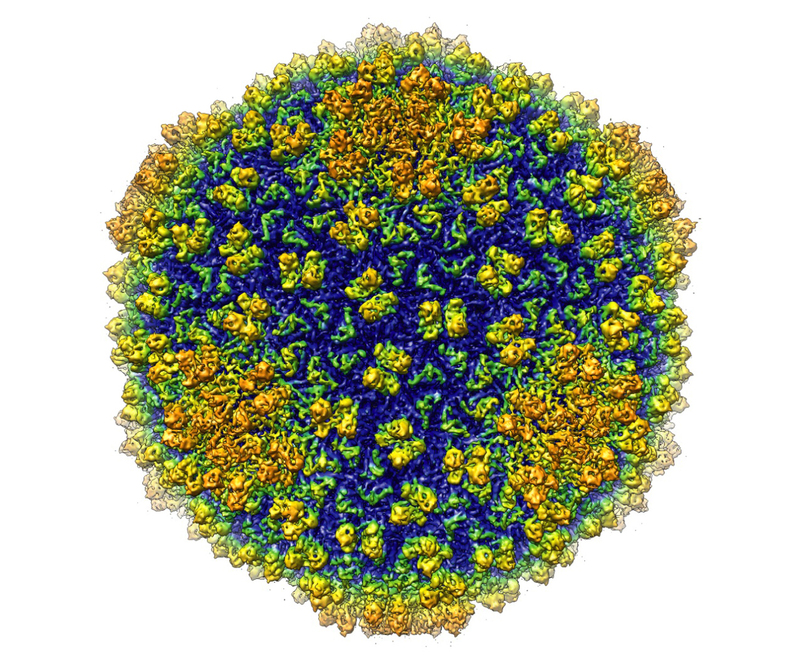 The imaging technique, called cryo-EM, has the added benefit of maintaining the sample being studied in a state very similar to its natural environment. Other imaging techniques used regularly, such as X-ray crystallography, require the sample be manipulated. A paper detailing the work was published in the Feb. 28 issue of Nature. Cryo-EM requires high-end electron microscopes and powerful computing resources. The research team used the Baylor College of Medicine's cryoelectron microscope. It is expected that Purdue will install a state-of-the-art cryoelectron microscope in 2009. In 2006 Purdue received a $2 million grant from the National Institute of Health to purchase the microscope. It will be installed in Hockmeyer Hall of Structural Biology, expected to open in 2009. In addition to Jiang, Matthew L. Baker, Joanita Jakana and Wah Chiu from Baylor College of Medicine, and Peter R. Weigele and Jonathan King from Massachusetts Institute of Technology worked on the project, which was funded by the National Institutes of Health and the National Science Foundation.